by Chris Woodford. Last updated: December 24, 2018. Transistors are the tiny electronic components that changed the world: you'll find them in everything from calculators and computers to telephones, radios, and hearing aids. They're amazingly versatile, but that doesn't mean they can do everything. Although we can use them to switch tiny electrical currents on and off (that's the basic principle behind computer memory), and transform small currents into somewhat larger ones (that's how an amplifier works), they're not very useful when it comes to handling much bigger currents. Another drawback is that they turn off altogether as soon as the switching current is removed, which means they're not so useful in devices such as alarms where you want a circuit to trigger and stay on indefinitely. For those sorts of jobs, we can turn to a somewhat similar electronic component called a thyristor, which has things in common with diodes, resistors, and transistors. Thryristors are reasonably easy to understand, though most of the explanations you'll find online are unnecessarily complex and often confusing beyond belief. So that's our starting point: let's see if we can take a clear and simple look at what thyristors are, how they work, and what kinds of things we can use them for! Photo: A typical thyristor looks a bit like a transistor—and works in a closely related way. First, let's nail some terminology. Some people use the term silicon-controlled rectifier (SCR) interchangeably with "thyristor." In fact, silicon-controlled rectifier is a brand name that General Electric introduced to describe one particular kind of thyristor that it made. There are various other kinds of thyristors too (including ones called diacs and triacs, which are designed to work with alternating current), so the terms aren't completely synonymous. Nevertheless, this article is about keeping things simple, so we'll just talk about thyristors in the most general terms and assume SCRs are exactly the same thing. We'll refer to them as thyristors throughout. 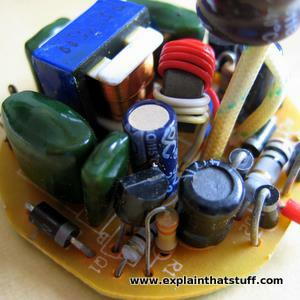 Photo: Thyristors are widely used in electronic power control circuits like this one. How a transistor works: A small current flowing into the base makes a larger current flow between the emitter and the collector. This is an n-p-n transistor with red indicating n-type silicon, blue indicating p-type, black dots representing electrons and white dots representing holes. A similar thing happens inside a FET, except that we apply a small voltage to the gate to produce an electric field that helps a current flow from the source to the drain. If we remove the small current at the base (or gate), the large current immediately stops flowing from the emitter to the collector (or from the source to the drain in a FET). Now often that's not what we want to happen. In something like an intruder alarm circuit (where maybe an intruder steps on a pressure pad and the bells start ringing), we want the small current (activated by the pressure pad) to trip the larger current (the ringing bells) and for the larger current to keep on flowing even when the smaller current stops (so the bells still ring even if our hapless intruder realizes his mistake and steps back off the pad). In a thyristor, that's exactly what happens. A small current at the gate triggers a much larger current between the anode and the cathode. But even if we then remove the gate current, the larger current keeps on flowing from the anode to the cathode. In other words, the thyristor stays ("latches") on and remains in that state until the circuit is reset. Where a transistor generally deals with tiny electronic currents (milliamps), a thyristor can handle real (electric) power currents (several hundred volts and 5–10 amps is typical). That's why we can use them in such things as factory power switches, speed controls for electric motors, household dimmer switches, car ignition switches, surge protectors, and thermostats. Switching time is practically instantaneous (measured in microseconds), and that useful feature, coupled with a lack of moving parts and high reliability, is why thyristors are often used as electronic (solid-state) versions of relays (electromagnetic switches). Thyristors are a logical extension of diodes and transistors, so let's briefly recap on those components. If you're unfamiliar with solid-state electronics, we have longer and clearer explanations of how diodes work and and how transistors work, which you might like to read first. A forward-biased diode: current flows across the junction between the p-type (blue) and n-type (red), carried by electrons (black dots) and holes (white dots). A reverse-biased diode: with the battery connected the other way, the "depletion zone" at the junction gets wider, so no current flows. A thyristor is like two junction diodes connected together, but with an extra connection to one of the inner layers—the "gate." You can see that this resembles two junction diodes connected in series, but with the extra gate connection at the bottom. Just like a diode, a thyristor is a rectifier: it conducts in only one direction. You can't make a thyristor simply by wiring two diodes in series: the extra gate connection means there's more to it than that. If you're quite familiar with electronics, you'll note the resemblance between a thyristor and a Shockley diode (a kind of double diode with four alternating semiconductor layers, invented by Transistor pioneer William Shockley in 1956). Thyristors evolved from Shockley's transistor and diode work, which was further developed by Jewell James Ebers, who developed the two-transistor model we're going to cover next. What's less obvious is that the four layers work like two transistors (an n-p-n and a p-n-p) that are connected together so the output from one forms the input to the other. The gate serves as a kind of "starter motor" to activate them. A thyristor is also like two transistors connected together, so the output from each one serves as the input to the other one. Normally, with no current flowing into the gate, a thyristor is switched off: no current can flow from the anode to the cathode. Why? Think of the thyristor as two diodes joined together. The upper diode and the lower diode are both forward biased. However, that means the junction in the center is reverse biased, so there's no way for current to get all the way from the top to the bottom. This state is called forward blocking. Although it's similar to forward-bias in a conventional diode, no current flows. Suppose we reverse the anode/cathode connections. Now you can probably see that both the upper and lower diodes are reverse biased, so still no current flows through the thyristor. This is called reverse blocking (and it's analogous to reverse bias in a simple diode). The third state is the really interesting one. 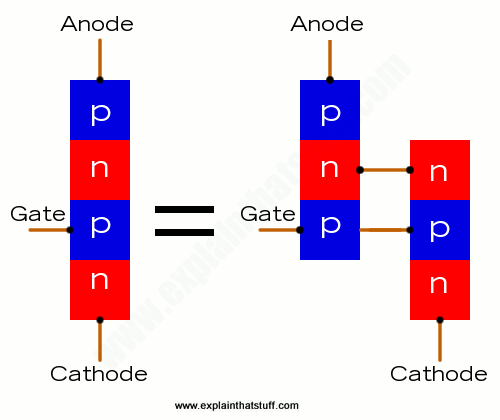 We need the anode to be positive and the cathode negative. Then, when a current flows into the gate, it switches on the lower transistor, which switches on the upper one, which switches on the lower one, and so on. Each transistor activates the other. We can think of this as a kind of internal, positive feedback in which the two transistors keep feeding current to each other until both of them are fully activated, at which point current can flow through them both from the anode to the cathode. This state is called forward conducting and it's how a thyristor "latches" (stays permanently) on. Once a thyristor is latched on like this, you can't turn it off simply by removing the current to the gate: at this point, the gate current is irrelevant—and you have to interrupt the main current flowing through from the anode to the cathode, often by switching off power to the entire circuit. Don't follow that? Check out the animation in the box below, which I hope will make it clear. This little animation is a simple summary of how a thyristor latches on. You'll notice I've redrawn the thyristor so it looks like two transistors (a p-n-p at the top and an n-p-n beneath it) connected together, with the anode, cathode, and gate making the three external connections. Each transistor acts as the input to the other. So how does it work? With no current flowing into the gate, the thyristor is switched off and no current flows between the anode and the cathode. When a current flows into the gate, it effectively flows into the base (input) of the lower (n-p-n) transistor, turning it on. Once the lower transistor is switched on, current can flow through it, activating the base (input) of the upper (p-n-p) transistor, turning that on as well. Once both transistors are turned on completely ("saturated"), current can flow all the way through both of them—through the entire thyristor from the anode to the cathode. Since the two transistors keep one another switched on, the thyristor stays on—"latches"—even if the gate current is removed. Somewhat simplified, that's the crux of how a thyristor works. There are numerous variations, including gate-turn off (GTO) devices (that can be turned on or off by the action of the gate), AGT (anode gate thyristor) devices that have a gate going to the internal n-type layer near the anode (instead of the p-type layer near the cathode), photoelectric thyristors in which the base is activated by light, and all kinds of others. But they all work in broadly similar ways, with a gate tripping one transistor, which then trips the other. Power Electronics Handbook: Devices, Circuits, and Applications by Muhammad Rashid (ed). Elsevier 2018. 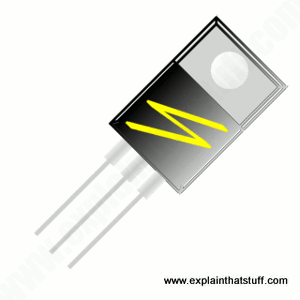 Chapters 7–9 cover thyristors. Foundations of Electronics: Circuits and Devices by Russell L. Meade and Robert Diffenderfer. Cengage Learning, 2002. Chapter 30 covers thyristors, including silicon controlled rectifiers, diacs, and triacs. Industrial Motor Control by Stephen Herman. Cengage Learning, 2013. Chapter 62 is a good overview of SCRs, while chapters 63–64 cover diacs and triacs. Silicon controlled rectifier manual by General Electric, 1964. This is the definitive (400-page) guide to GE's own brand of thyristors. How B. Jayant Baliga Transformed Power Semiconductors by David Schneider. IEEE Spectrum, April 27, 2014. Celebrating the work of B. Jayant Baliga, winner of the 2014 IEEE Medal of Honor, developing thyristors and other power semiconductors. Try a Triac by Charles Platt. Make, January 10, 2014. Learn about triacs with this hands-on LED project. The silicon p-n-p-n switch and controlled rectifier (thyristor) by Nick Holonyak, Jr. IEEE Transactions on Power Electronics, Jan 2001, Volume 16 Issue 1, pp8–16. This interesting paper (by the inventor of the LED) describes the historical development of thyristors by William Shockley, Jim Ebers, and others. Early power semiconductor history at GE: The Semiconductor Museum presents an early history of the silicon controlled rectifier, as told in an oral history by one of its pioneers, F.W. "Bill" Gutzwiller. US Patent 3,040,270: Silicon controlled rectifier circuit including a variable frequency oscillator by F. Bill Gutzwiller. One of General Electric's original SCR (thyristor) patents.